Climate change is being caused by a combination of factors, but the most important is the increase of greenhouse gases in the atmosphere, and especially carbon dioxide. Most of this extra carbon dioxide is being released by burning carbon-rich fuels. This is the same process that turns sugar into energy in our bodies, but it is more violent, releasing the energy as searing heat. The most basic of all fuels is wood, which people have been burning for thousands of years to keep warm and to cook their food. Huge increases in human populations have greatly increased the amount of wood that is burned like this each year. At the same time, vast forests are being cut down and burned to clear land for farming, ranching, and road building, especially in the tropics. This is also contributing to climate change by releasing all the carbon that the forest trees have absorbed over their lifetimes. As a tree grows, it absorbs carbon dioxide and converts it into sugar, plant fiber, and wood. The wood stores carbon, but when the tree dies and decays, the carbon is released. In mature forests, dead trees are decaying as fast as live trees are growing. So although such forests act as carbon stores, they release as much carbon dioxide as they absorb. When trees catch fire, the carbon in their timber combines with oxygen to release energy and carbon dioxide. Wildfires are part of the natural carbon cycle, and the carbon dioxide they release is soon absorbed by young trees. But if a forest is cut down, burned, and not allowed to regrow, all its carbon is turned into carbon dioxide that increases the greenhouse effect. If a burned forest is able to regrow, the new trees eventually soak up the carbon dioxide released by the fire. 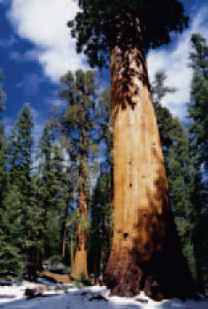 But this may take a century or more, because young trees do not absorb as much carbon dioxide as big, mature trees. If the land is planted with crops like these, or becomes grassland, the small plants absorb even less carbon dioxide—and when they are harvested or grazed by animals, the carbon they contain is released again. 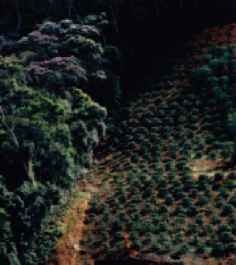 Huge areas of tropical forest are being destroyed. Brazil has lost more than 163,000 sq miles (423,000 sq km) of forest since 1990—enough to cover California—and Indonesia has lost nearly 116,000 sq miles (300,000 sq km). In the Caribbean state of Haiti, more than 95 percent of the forests have been cut down, devastating the landscape. 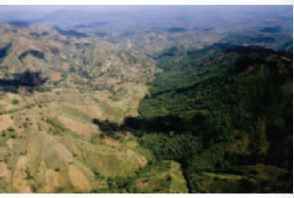 This photograph shows the border between Haiti, on the left, and the neighboring Dominican Republic which still has large tracts of forest. When forests are cut down, the bare ground often reflects more sunlight than the trees that have been removed, causing cooling. But meanwhile the exposed soils start releasing greenhouse gases such as carbon dioxide, nitrous oxide, and methane. In Indonesia, the soils of swampy lowland forests contain a lot of waterlogged peat. If the forest is cut down, the peat can dry out and decay. As shown in this photograph, the peat sometimes burns, releasing more carbon dioxide. Altogether, the greenhouse gases released by deforestation far outweigh the cooling effect of the bare ground. 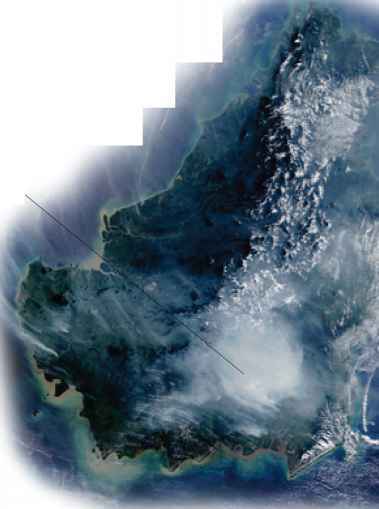 Forest fires generated the smoke seen here in the atmosphere above Borneo in 2002. The smoke is made up of gases and soot that combine with water vapor to form clouds of airborne particles called aerosols. These can absorb and reflect sunlight, causing cooling. But carbon dioxide released at the same time persists for much longer, adding to the greenhouse effect. SUSTAINABLE FUEL Wood can be used as a"carbon-neutral"fuel if more wood is grown to replace it. An old technique called coppicing involves cutting wood from a living tree and allowing new shoots to sprout from the trunk. When the firewood is burned it releases its carbon as carbon dioxide, but this is soaked up by the regrowing timber. How the burning of forest cause greenhouse gases? Does burning of trees cause green house effect? 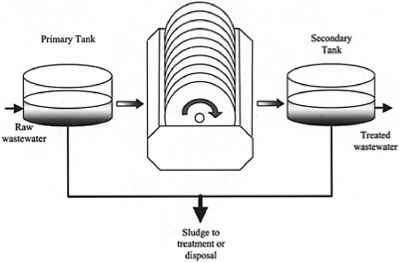 How to use gases released in burning of wood?